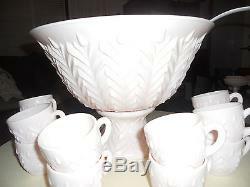 This punch bowl set is in excellent condition, never been used condition. I is approximately 9 1/2 tall with the stand and approx. 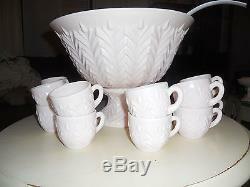 The item "Vintage Jeannette Shell Pink Punch Bowl with Stand, Ladle, and 12 Cups" is in sale since Friday, February 19, 2016. This item is in the category "Pottery & Glass\Glass\Glassware\40s, 50s, 60s\Jeannette". The seller is "pictureus1946" and is located in Rochester, New York. This item can be shipped to United States.